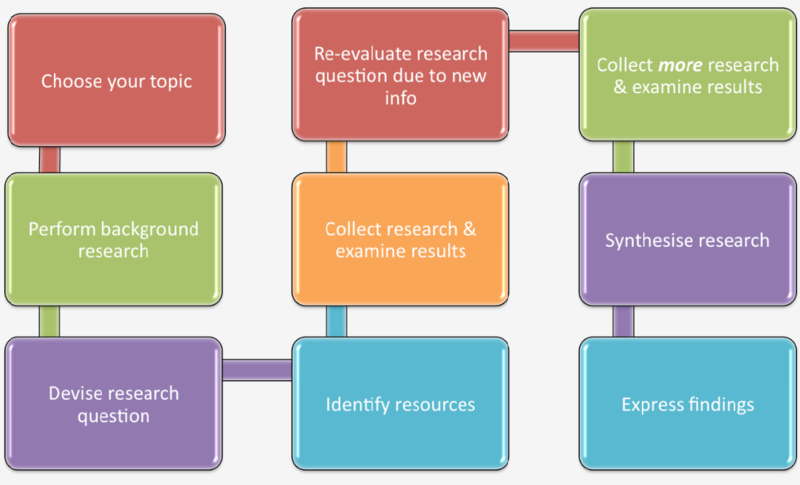 This guide provides an introduction to the research process. This guide will assist you through the various steps of the research process, including selecting a topic, locating information, finding keywords, searching library resources, and evaluating and citing sources. Simply click through the tabs on the left to learn more. If you are having trouble at any point during the research process or have any questions, please contact a SC4 librarian for help! You may also check out our Research Guide on How to Navigate the Library for more information on getting around the library and the library website. The SC4 Writing Center, located in 313 Main Building, is another good resource for help with research and writing. Image: Fanning, D.L. (2012). Research and stuff: Tools and strategies for the beginning academic researcher. In C.T. Jordan (Ed. ), Open 2010: A composition textbook for WRTG 2010 at the University of Utah. Salt Lake City, UT: University Writing Program, University of Utah. Choose your topic. See the tab Selecting a Topic for more guidance. Perform background research. Check encyclopedias, dictionaries, newspapers, and trustworthy internet sources. Think about your research question. This is usually the overall question you'll be answering with your research paper. Search for resources. Once you've idenitified your main subject, you can begin to look for specific sources on the topic, either by using the databases or through OneSearch. Organize your research. After you've done your research and gathered your sources, using a bibliography software like Refworks can be useful in keeping track of your research and your chosen sources. Re-evaluate your research question and evaluate your sources. If you've found too much or too little information for your topic, it may be time to re-evaluate and perhaps alter your topic. You'll also want to keep the CRAAP Test in mind when evaluating your materials. Collect more research (if needed). If you need more or different sources, check out the Search Strategies tab for help on effective searching, or ask a librarian. Combine your research sources. Stay focused on your research question and think about how all your research fits together. Write that paper! If you've kept good notes, made sure to create an outline, and done your research, writing your paper should be fairly straightforward. If you have any questions or problems, the Writing Center, a librarian, or your instructor can help. Adapted from Fanning, D.L. (2012). Research and stuff: Tools and strategies for the beginning academic researcher. In C.T. Jordan (Ed. ), Open 2010: A composition textbook for WRTG 2010 at the University of Utah. Salt Lake City, UT: University Writing Program, University of Utah and http://libguides.apsu.edu/How-to/researchprocess.